Is Your Business Getting Nowhere? You Could Drive Torrential Of Traffic And Generate Thousands Sales With Mobile Marketing! 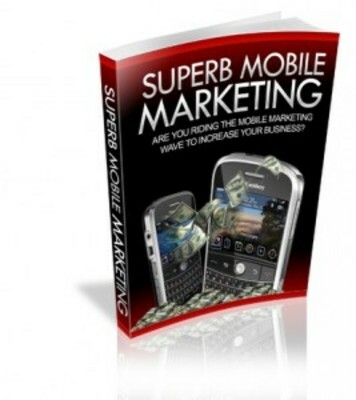 Learn Turbocharged Mobile Marketing Strategies And Make Your Business Explode! Let The Dollars Pour In Without The Stress Of Having To Find Customers. Plus, No More Expensive Advertising! Are you self-employed or a local business owner? Are you looking for ways to attract more customers to your products and services? Are your current sales way below your expectations? Are you clueless on how to increase your sales? Depressed seeing mediocre results? Pause a while and think.... You can advertise your products and services to get people to know about your business. Where should you advertise? Tried newspapers? Magazines? Classified ads? Billboard ads? NO NO NO, Its MOBILE MARKETING! Let Everyone Know About Your Business Today Super Fast And Effective! MRR ebook comes with pdf, give away rights and resale material.